The breathtaking islands of Phi Phi administratively belong to Krabi Province, not to Phuket like I initially thought. Full-day excursion can be arranged as it is located only 40 km away from Phuket. There are plenty of travel agencies offering the island hopping tour, lots of package options to choose from as well. After much thought (and email conversations), I settled with Phuket SRC's Phi Phi Maya Khai Island Premium Service. Our tour came with pick up and drop off from our budget accommodation in Patong. The shuttle arrived a few minutes late than expected, probably because we were the last four passengers to be picked up. We were taken to Royal Phuket Marina where most boat tours commence. We signed a trip document and the staff gave us wristbands to wear. The color of the band corresponds to the tour package booked. Ours were blue while others had orange and pink. After the registration, we helped ourselves in the breakfast table. Bread, cookies, coffee and Thai Iced Tea (Yay! I LOVE!) were served. Pre-tour briefing followed. Dos and don'ts were said and anti-seasick tabs were handed out. Day trippers were gathered according to the color of the wristbands. We followed the staff, there were six of them if I remember correctly, assigned for our "blue" group. They led us to the quay where a speedboat is waiting to whisk us to Phi Phi. So, this is what the premium tour looks like. Just a little space to wiggle around, still it was comfy ride. After almost an hour speedboat ride, we entered the semi-enclosed lagoon of the world-famous Maya Bay. It is a stunning beach cove made famous by Leonardo DiCaprio's movie The Beach. It is actually the main reason why I wrote down Phi Phi on my travel list. Blame Leo! Hahah! The towering limestone karst surrounding it seems to protect a mystical paradise, just like what it portrays in the Hollywood film. Okay, enough with the expectations. In reality, Maya Bay is a sight to behold despite the crowd. It has the finest white sand that I have ever stepped on, clear blue waters and impressive rock formations. Oh hello there Maya Bay! And so, The Beach has been discovered! Longtail boats are used by visitors coming from the nearby islands. Day trippers from Phuket can only go to Maya Bay via speedboat or cruiser. 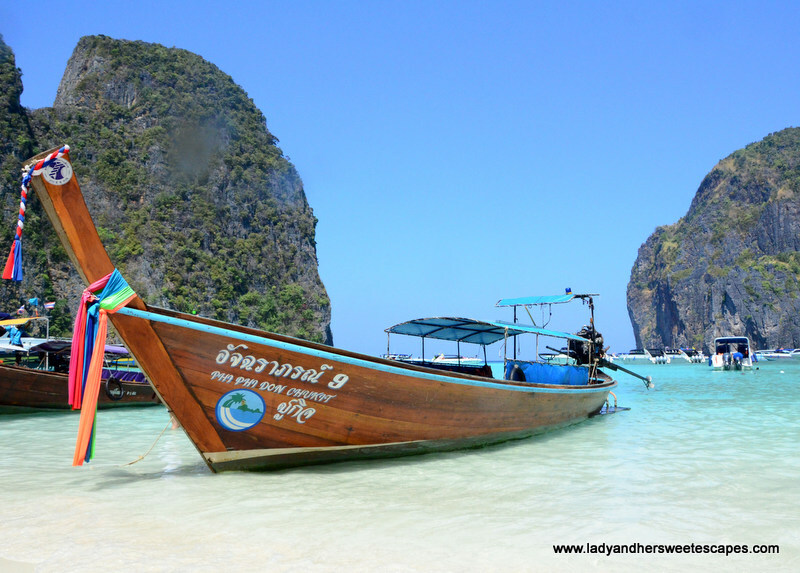 Our speedboat sailed to the northwest tip of Phi Phi Leh where the Viking Cave is located. It is also known as the Birds Nest Cave because it is inhabited by swiftlets, the type of bird that makes edible nests popularly used in Chinese soup. The boat simply passed by the mouth of the cave, just for us to see bamboo scaffolding that the locals climb on to during harvest. Next stop was at the Monkey Beach. It is called as such because it is literally a home to a colony of monkeys. We were not allowed to walk in the shore, not allowed to give food or play with the monkeys while in the boat either. The staff were kinda overprotective of us... or maybe of the monkeys. Hahah! I heard some stories of monkey bites, so I guess staying in the boat was for our own good. We never went hungry in Phi Phi. Fruits, biscuits and drinks were overflowing on board the speedboat. 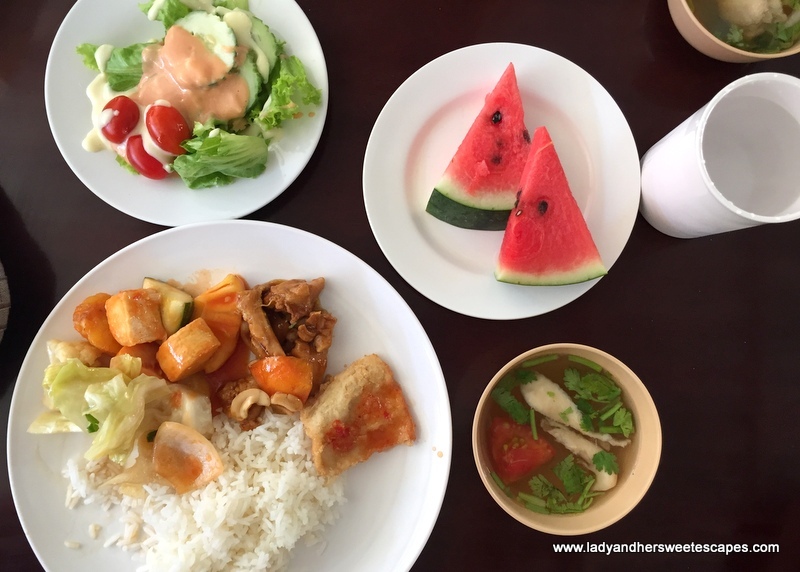 And during lunch time, we were taken to a beach in Phi Phi Don for a delicious lunch buffet. After lunch, we headed to a snorkeling area. We took out the snorkeling gears which were given to us earlier at the marina and dived into the deep blue ocean! I wore my life vest of course! I am a weak swimmer, but it was the activity that I enjoyed the most during our Phi Phi island tour. The water is so clear! I could see the fishes and corals without even diving deep down the sea. Our last stop was at Khai Nok. It is a lovely little island with white sand beach and huge granite rocks. But I must say, this island is completely swallowed by commercialism. There are souvenir shops, food stalls and vibrant parasols for rent. Ed and I attempted to sit in the sun loungers and we were asked to pay 150 Baht. Nooo way. I laid out my sarong by the shore and sat there instead. Thankfully, we didn't have to buy food as the tour agency has a stall in the island where we can have snacks and drinks for free. I sought refuge from the sun in the huge rocks by the shore. We called it a day in Koh Phi Phi and sailed back to Royal Phuket Marina. It was a long fun day. Despite the case of expectation vs reality in Maya Bay, I did not regret having Koh Phi Phi in my 20 Before 2020 list. This day trip, just like all the other options I found, have highs and lows. A disadvantage is that I didn't get to enjoy the powdery sands of Maya Bay that much because of the limited time. But, looking at our travel schedule, seeing several islands in one day is the best option that I have. We were back in the hotel at 5:30 PM. I had time for a quick shower before we rushed to Patong Beach to catch the sunset.